@Turkleton, I love the office! Gettin' real tired of your sh*t, Tim. GUYS i figured out why invalid chicken has been doing the things he's been doing (stuff like saying FIRST In the comments) he is sad or depressed as to where he has decided to commit suicide, social suicide. Or the possibility of suddenly deciding to not be involve In funny pics any more as to where he just lets everyone hate him! And if he does that then nobody will miss him. So guys if you've read down this far just consider the possibilities of his actions, also there is the possibility he's been hacked. If I had a nickel for everytime I had to explain that I'm allergic to tree nuts, but not peanuts cause they're not nuts. I'd have like a dollar twenty. Tim don't give a f*ck though. so if he gets teabagged, he dies? @RickJamesFilms, why did you say "the" in French 10 times? My name is time and these comments hurt me feels. Why is it always Tim? It's kind of like cartoons where you can defy physics as long as you don't think about it. 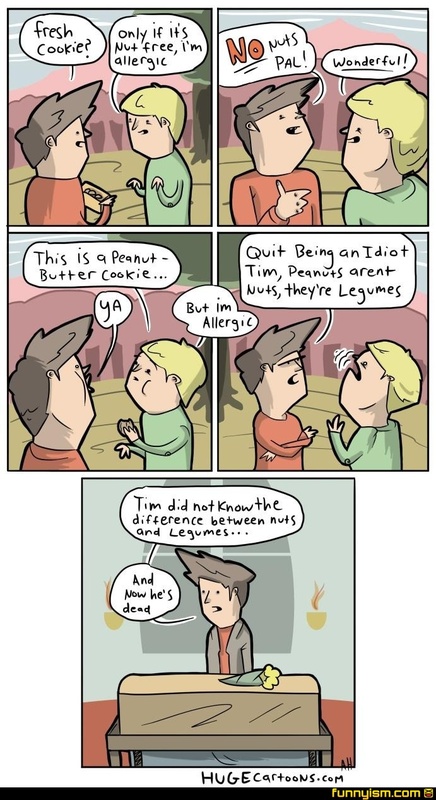 Nuts and legumes.. Know the difference..